This hallowed rule of Italian cooking - cooking pasta until it is neither mushy nor crunchy, but has a texture you can bite into, where the name "to the teeth" comes from - is non-negotiable. But if you've only heard of it on television and have not had the pleasure of cooking or eating with real Italians, how do you know what it is? Giovanni Rana, the man behind the Giovanni Rana pasta company which started in 1962, and his daughter-in-law Antonella have shared their time-honed tips for cooking pasta in the authentic, traditional Italian way - with the caveat that there may be no "true" Italian way to cook pasta. "There are a lot of urban legends about al dente pasta but in Italy, not everybody loves al dente pasta", says Antonella, speaking to The Daily Mail. "In the North, they love it a little softer, into the South they love their pasta almost raw", while it's unlikely that Italians actually throw pasta at the wall to check if it is al dente, as cooking lore goes. If you are cooking from a packet, she suggests simply following the instructions, though fresh pasta is the quickest to cook: "We’re talking about just two minutes." Regardless of what kind of pasta you're making, there is a technique to it. Antonella says "Wait for big bubbles, then add salt, start the timer, check every two minutes, then drain and serve". "I personally love to drain the pasta 15 seconds before the full cooking time. If it’s written two minutes, I drain at 1:50 and in the very last 10 seconds I use a mixing bowl to mix the sauce in. This way you don’t overcook your pasta." While we've been taught to honour the al dente pasta above everything else, Antonella says that another common mistake is using the wrong proportions of sauce for pasta. She cautions against using the pasta as a blank canvas for sauce, instead insisting that both must work together to create the flavours of the dish. "When you have a great pasta, the flavour is inside. You just need to add a drizzle of extra virgin olive oil and a sprinkle of Parmigiana Reggiano. If you want to enhance the flavour more then use the sauce, but only in a small spoon." For Antonella, a pasta dish drowned in sauce is a dead giveaway that a cook doesn't know how best to cook Italian food. "When you're speaking about fresh pasta tortellini, the filling has its own taste and power, as Italians we try not to cover it too much with the sauce", she says. "Especially ricotta and spinach which is so delicate and so pure, that if you add a lot of sauce, you will see the pasta swimming in the sauce. It’s not a good sign. 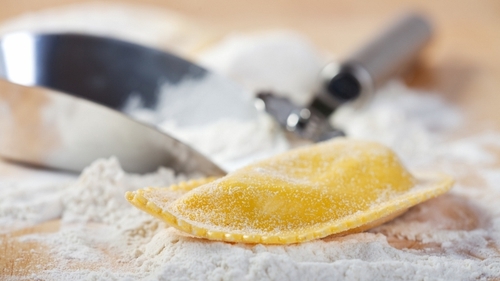 "In general, the most traditional way to eat fresh filled pasta is to be very respectful of the proportions. The queen is the pasta and the sauce is the tool." When it comes to pasta cardinal sins, tomato ketchup is the big no-no for Antonella. Rather than attempt to imitate a pasta pomodoro with tomato sauce from a bottle, she suggests playing with flavours in a traditional Italian tomato sauce. "In the tomato sauce you can really play with more veggies, for example, garlic, onion, carrot, celery or you can play with extra virgin olive oil, salt and pepper. You can also play with the fresh herbs such as basil but this is the spirit of tomato sauce, freshness and a light touch", she says. "Then grate - from scratch - Parmigiano-Reggiano, 24 or 23 months on top. That is a signature and everyone will think you’ve lived in Italy." If that seems like too much of a time commitment, never fear: Antonella says a simple sauce of roughly chopped onion, garlic, fresh ripe tomatoes cooked down for a few minutes and finished with basil makes a classic and delicious pasta sauce. When pasta is your staple meal during the week, there are parts of it that you never think to question, such as why do recipes call for extra virgin olive oil and not just olive oil? Antonella explains. "Never buy just olive oil as this means the olive fruits have been pressed two, three times and also their bones. When you buy extra virgin it means they’ve pressed the olives just once and they press the pulp – the colour, flavour, nutrients and everything is better." Cutting corners leads to cut flavours, she says, and warns against using pre-grated parmigiana reggiano. "Always buy parmigiana reggiano in a whole piece where you can see the crust and the stamp. Never buy it already grated, as you’ve already lost half the flavour", she says. "You also need two kinds of salt, the rock one to place in the water before the pasta and flakes to season. When preparing pasta, add the salt when the water is boiling and then only after use the salt flakes." "About the pepper, I love the delicate ones because I believe that pepper has to be nuance not the protagonist of the recipe. The last basic is fresh herbs such as basil, thyme and chive. I believe that when you cook with fresh herbs, wash and chop roughly your dish is already king."